The S2330MX is a 23-inch monitor with DVI and VGA out. 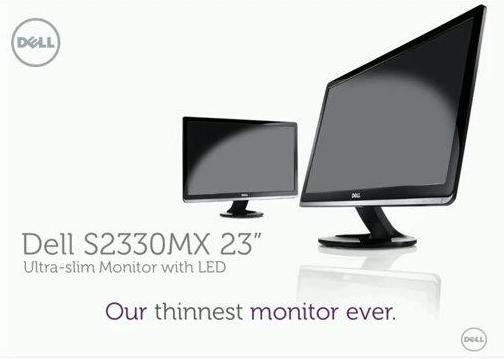 Expect the ‘HD’ banding to be all over the place as this is a 1920x1080 screen.The panel is LED backlit, which enables its slim profile.The S2330MX still boasts 2ms response times.When purchasing a monitor, most buyers expect a few key things from their investment: good performance, enough connection options to meet their needs, and a reasonable price.The monitor has flimsy build quality, a very unstable foot stand, and its OSD navigation isn't as smooth as what we've come to expect from Dell. Color performance, though good overall, was plagued by the nearly impossible-to-escape green hue problem that crops up on many monitors during the color-tracking test.Compared with the Samsung S23A550H, the S2330MX lacks vibrancy and its colors don't pop from the screen quite as well. The advantage of LED back-lighting is that it saves a bit of power and produces deeper blacks. 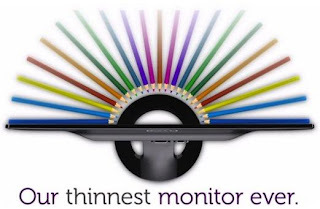 Be aware that the monitor has HDMI and DVI adapter before we tell you that the cables that connect to this monitor are thicker than the monitor.